A major tributary of north Lake Powell, Trachyte Creek drains the eastern slopes of the Henry Mountains and joins the lake 8 miles from Hite. 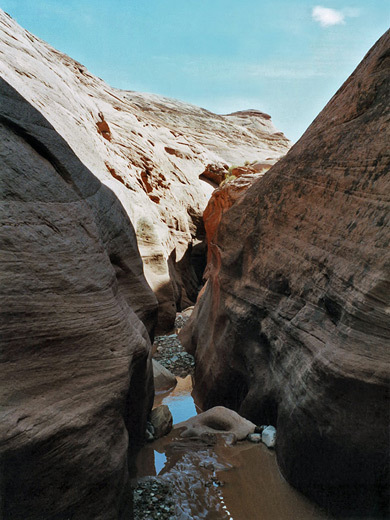 The creek and its numerous tributaries are incised into a red slickrock wilderness - the surrounding land is a maze of Navajo sandstone canyons, domes, ridges and crumbling colorful strata, part of a tremendously scenic, little known region although with relatively easy access provided by UT 276 and 95. Four mile long Maidenwater Canyon is the best of over a dozen major tributaries and has two main forks each of which have an upper section, west of UT 276, containing deep, colorful and very narrow slot passages that drop quite steeply and require ropes to fully explore. The two branches become shallower and open out east of the highway, merging to form the lower canyon which offers more moderately good narrows, pools and dryfalls. The majority of the side canyons of Trachyte Creek join from the east, and cut across land that rises gradually up to Trachyte Point, a flat topped ridge, the far side of which is much steeper and ends with sheer cliffs that form the edge of North Wash Canyon. Scenic highway UT 95 runs through this canyon but although only 2 miles from the upper reaches of the Trachyte tributaries, the cliffs make access impossible; instead the road to use is UT 276 which branches southwards once the cliffs have receded, crossing the upper part of Trachyte Point and over the creek itself. For the next 10 miles the road passes by the foothills of the Henry Mountains and the upper ends of several of the west side tributaries including Maidenwater Canyon, Swett Creek and Trail Canyon, then descends into the Cane Spring Desert, ending at Bullfrog Marina on the shores of Lake Powell. None of the side canyons are signposted, so a good map is recommended to locate the particular drainage of interest. 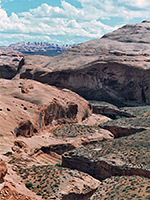 The two main forks of Maidenwater Canyon are separated by half a mile of UT 276, with a smaller branch another half mile to the north. The middle fork crosses at milepost 9, with the south (main) branch at about mile 9.5. 11 views of lower Maidenwater Canyon. 8 views of upper Maidenwater Canyon (south fork). TopoQuest topographic map of Maidenwater Canyon. The southern branch of Maidenwater canyon provides the easiest means to reach the lower narrows, access being via a rocky gully by the east side of the road, just next to a parking area (this point is about half way between mileposts 9 and 10, maybe slightly closer to 9 than 10). 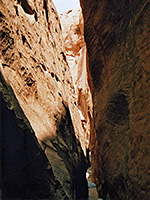 The original course of the canyon is blocked by the road embankment and the flood waters from the upper drainage now pass through a man made tunnel in the rock. The tunnel is high enough to walk through if desired though it is quite dark in the middle, and has a deep hole half way along. The junction with the middle fork is reached after 10 minutes hiking, through shallowish, boulder-filled channels that may contain pools a few feet deep after recent rains although all can be bypassed and no wading is needed. A little further the canyon drops by 25 feet, an obstruction which is easy to pass on the left side, by following a faint path down a slope back to stream level. 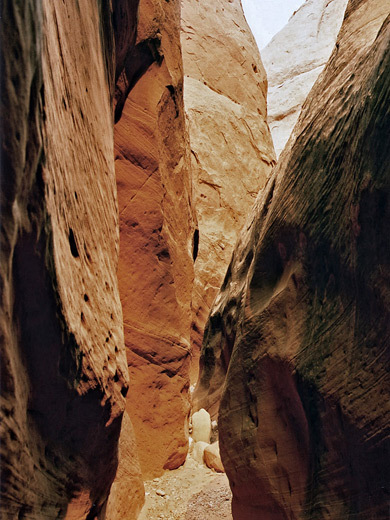 The main narrows begin soon after and last for about half a mile; the canyon here is generally 6 to 10 feet wide and although not particularly deep there are some passages sufficiently dark and enclosed for the classic slot canyon reflected light effects, as the rock is the familiar red Navajo sandstone, which produces the best colors and patterns. The floor is composed of a mixture of sand and small pebbles, with occasional chokestones preceding drops of 3-4 feet and the likelihood of pools beyond, but nothing too difficult. The canyon opens out to a nice section filled with bushes and cottonwood trees, their bright green leaves contrasting with the deep red rocks and blue sky. Another short narrow section ends at a big boulder with a 3 metre drop into a much larger pool. Jumping down here is perhaps not advisable so instead one option is to climb out and follow at rim level. The only route out is about 150 feet back, up the cliffs on the north side at a point where the gradient is just enough away from vertical to climb/walk up, away from the moist, grassy canyon and into a world of bare rock - pure, undulating sandstone with domes and plateaus that extend in all directions. The canyon ahead has no easy re-entry points but seems not to become narrow again, and the junction with Trachyte is not too much further anyway. A small summit affords excellent views over both canyons and to distant ridges and eroded rocks to the west, including some pointed formations that resemble the needles of Canyonlands National Park. A round trip to this point takes 3-4 hours. 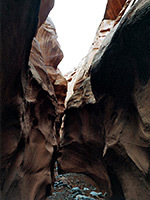 The upper south fork can be entered where it crosses under the road at mile 9.5, by walking down the embankment, though not directly into the streamway as it has one impassable dryfall just upstream, instead along the canyon edge on the north side for a while then down where the floor levels out - or alternatively, there is a way down on the other side a little way along the south rim. Heading west, the canyon soon enters a short, sharp V-shaped slot that opens out briefly into a smooth, rounded chamber with a few bushes then closes in again as the walls rise very high and sheer. Only occasionally do they relent from here to the far upper end of the canyon and there is only one other possible entry/exit point for most of the way, up a steep, pothole-filled side ravine on the north side. 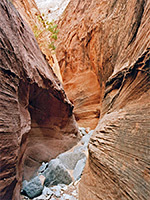 Maidenwater has generally straight, level passages interrupted by blocking dryfalls and chokestones, up to 10 feet high. There are maybe ten such obstructions over the course of half a mile, and progressing upstream is quite difficult and tiring, requiring lots of chimneying, scrambling and climbing. One boulder has a webbing ring which provides a handhold, and may not be free-climbable without. Wet weather brings the added inconvenience of lengthy pools, up to 3 feet deep though at other times the canyon is completely dry. Unassisted progress is halted about half way along the canyon, near the end of the best, deepest section and where the walls start to become less high, by a dryfall of about 20 feet created by 3 boulders on top of each other. There is a webbing attachment above here too, this being the last of 4 places where rappels are needed if descending from the top of the canyon, which is reached by a 1.5 mile hike from UT 276. Travelling from the dryfall in the reverse direction, back to the highway, is easier though still quite tiring. The upper canyon is deep, narrow and quite testing, good to practice up/downclimbing techniques, just not especially pretty - passages are straight, with no real overhangs or curvy formations, though they do have some nice patterns and angled strata in the rocks.